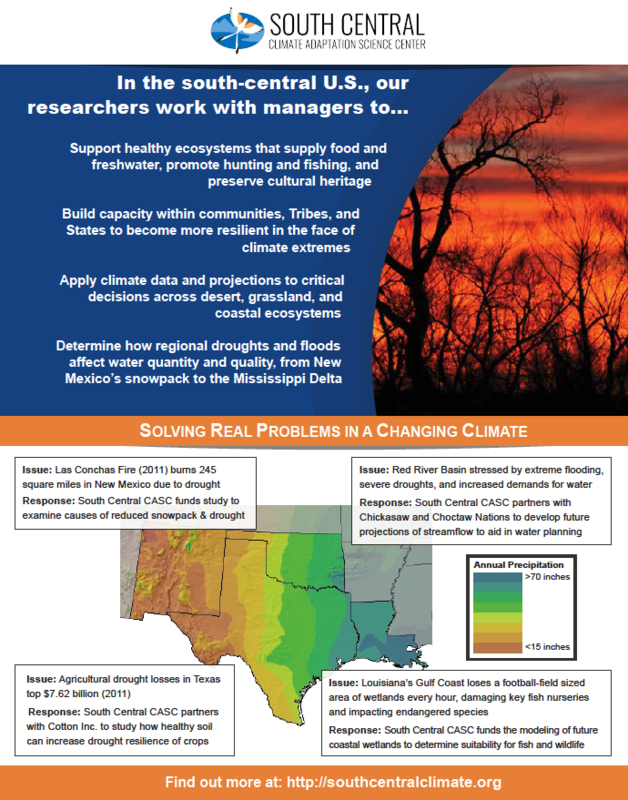 A brochure about the South Central Climate Adaptation Science Center. An online survey was sent to various decision makers located in the SCIPP region and was used to assess hazard and climate change planning, information use, and applications across the region. This survey was initially administered in 2009 and was administered again in 2013 to determine whether changes occurred since the first iteration. As one of the first major SCIPP research projects, the goal of this particular study was to better understand local and regional hazard planning across the Southern U.S., specifically from the perspective of those involved with developing plans. Poster presented at the 2017 Annual Meeting of the American Meteorological Society in Seattle, WA, related to the project Using Critical Thresholds to Customize Climate Projections of Extreme Events to User Needs and Support Decisions (see details on Research tab). 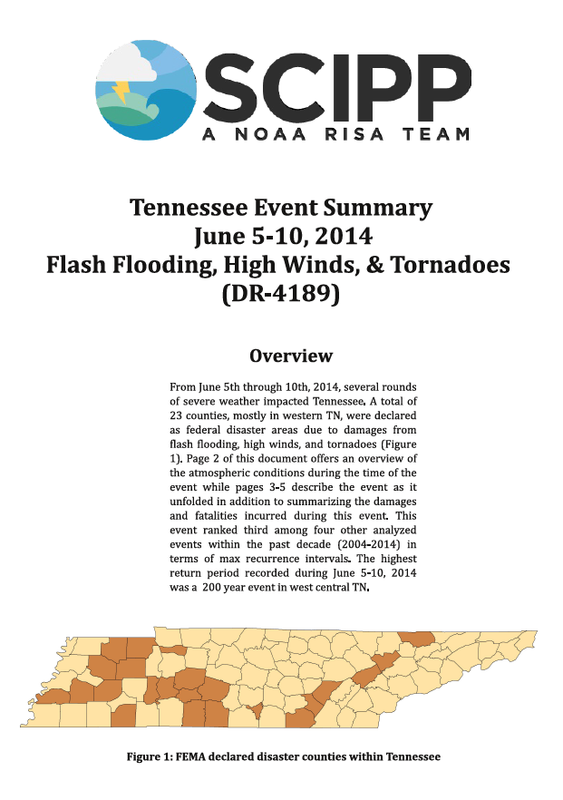 From June 5th through 10th, 2014, several rounds of severe weather impacted Tennessee. A total of 23 counties, mostly in western TN, were declared as federal disaster areas due to damages from flash flooding, high winds, and tornadoes. Page 2 of this document offers an overview of the atmospheric conditions during the time of the event while pages 3-5 describe the event as it unfolded in addition to summarizing the damages and fatalities incurred during this event. This event ranked third among four other analyzed events within the past decade (2004-2014) in terms of max recurrence intervals. The highest return period recorded during June 5-10, 2014 was a 200 year event in west central TN. 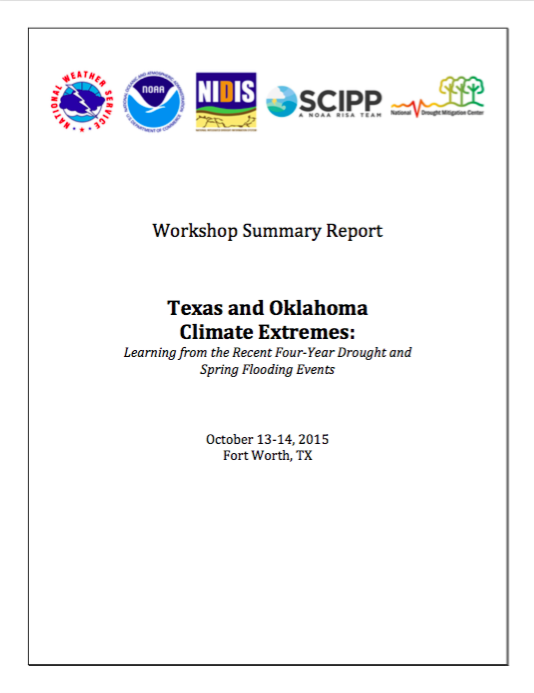 In October of 2015, representatives from state and federal agencies representing broad areas of water, public safety, infrastructure and other management participated in the workshop, Texas and Oklahoma Extremes: Learning from the Recent Four-Year Drought and Spring Flooding Events. This event was sponsored by NOAA’s National Integrated Drought Information System (NIDIS), the Southern Climate Impacts Planning Program (SCIPP), the National Weather Service Southern Region, NOAA’s National Centers for Environmental Information (NCEI) and the National Drought Mitigation Center (NDMC). This workshop was a NIDIS Southern Plains Drought Early Warning System (DEWS) activity with the goal of improving disaster reduction and building capacity for better decision-making relating to drought planning and mitigation. The workshop focused on the successes, challenges, lessons learned, and opportunities for future collaboration related to the recent 2010-2015 drought and spring 2015 flood events. The workshop included presentations and discussions about the shift from extreme drought to floods in 2015 and tactics the participants’ agencies used to manage the impacts of those events. Discussions specifically focused on monitoring tools, agency coordination, unexpected impacts, successes and public outreach. 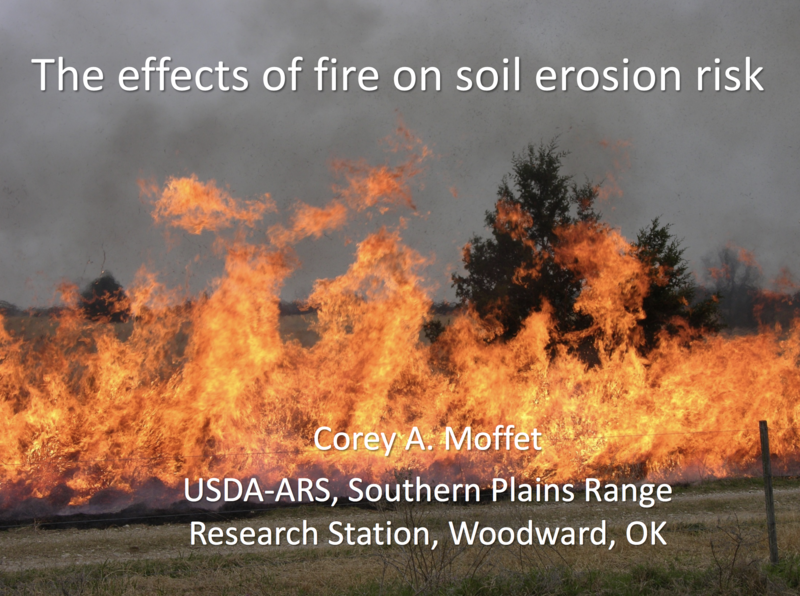 The "Effects of Fire on Soil Erosion Risk" talk was presented by Corey Moffet (USDA Woodward Agricultural Research Service) at the 2018 Southern Plains Wildlife Forum in Beaver, OK.